As a new startup, your primary goal is to find product-market fit. Marc Andreesen, who’s often credited with inventing the term, defined product-market fit as “being in a good market with a product that can satisfy that market.” In other words, you’ve built a product and found a group of people for whom that product solves a problem. It sounds simple, but finding product-market fit involves a lot of moving pieces. Carlos Espinal, partner atSeedcamp, provides a useful framework for the process in this blog post. Basically, you start out by making a hypothesis about what your product will do and what value it will deliver to your customers. Then, you build that product as quickly as possible and get it in front of your customers, to test whether your assumptions were correct. If they weren’t, you need to start making changes – either to your product, your customer segment or your strategy for bringing your product to your customers (“go-to-market strategy”). It’s this last piece of the equation, the go-to-market strategy, where games can really help. In order to start testing your product hypothesis, you need feedback from your target customers. And as we wrote in our lastpost, games are a great way to engage people’s attention. If you set up an ad game and deliver it to your target customers, it’s easy to draw them in and get them to try using your product. In order for this to work, though, you need to pick the right type of game. This is where a lot of founders get stuck. However, when you combine the concept of the minimum viable segment (MVS) with the fact that different types of consumers tend to prefer different types of games, it becomes an easy decision. MVS, which was first described by Michael Skok, is about choosing a narrowly-defined set of customers who have similar needs and then building a product that addresses those needs. If you’ve defined your MVS appropriately, your customers will most likely have certain demographic characteristics in common (e.g. if you’re building an exercise app for moms, your target customer base will be composed of older women). The graph plots game types by age and gender. The x-axis represents the percentage of females who make up the game type’s audience, while the x-axis represents the average age of the game type’s user base. 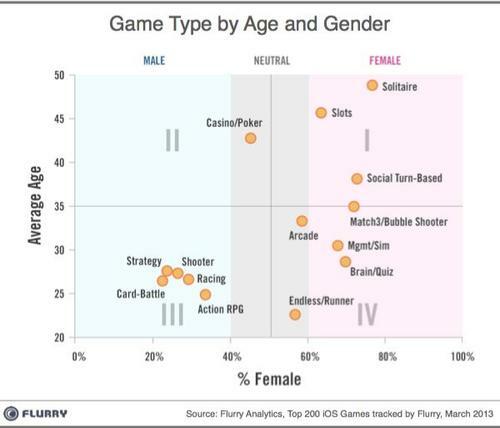 This means that games in the upper right corner are preferred by older females, games in the lower right are preferred by younger females, and so on. So how does this relate to ad games? If you’re a company with a product aimed at younger males, it suggests you should pick one of the game types in the lower left corner – racing, shooter, card battle, etc. But if you’re trying to reach a younger female audience, a quiz or bubble shooter game would probably be more effective. Of course, there’s always going to be variation in game type preference from person to person, and not every MVS will map neatly to one of these demographic quadrants. But if you’re a founder looking to quickly leverage the power of games to build up your user base and start testing product-market fit, this method is a great way to get started. This is the first article in a series about how startups can use games to engage their target customers on mobile. We’ll post one new article every Wednesday, so stay tuned. Before we go into the details of how you should use games in your mobile marketing strategy, I want to step back and talk about why you should use games in your mobile marketing strategy. The answer is pretty straightforward – adding a game to a marketing campaign can increase click-through-rates by 7x (see this infographic from Celtra for more stats) and decrease customer acquisition costs by 30%. In non-marketing speak, this means you end up getting a higher return on your advertising budget. Normally, if a company wanted to enjoy these benefits, they’d need to hire a game studio or an ad agency to build them a custom game. Most startups and small businesses just don’t have the time, budget or expertise to do that. Gamewheel was designed with these smaller advertisers in mind. It’s a self-service tool that allows you to create custom ad games and use them in your marketing campaigns, all without knowing anything about game design or coding. 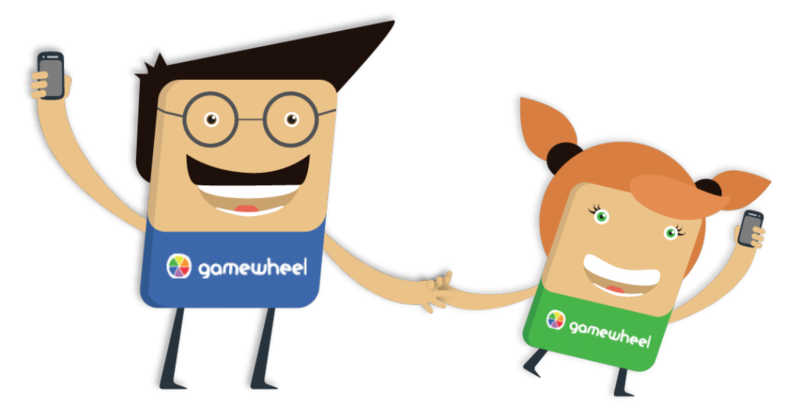 So games are a great tool for marketers, and Gamewheel makes them much more accessible. But like any tool, games are only effective when you know how to use them. That’s why we started this blog series – to help you get as much value as possible out of Gamewheel. Next week, we’ll kick things off with a post about product-market fit, minimum viable customer segments and how it all relates to ad games. Until then, have a great week!